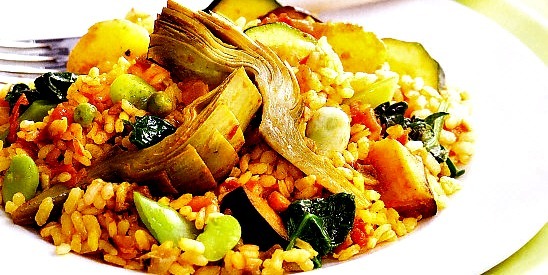 One of the legacies of the country’s Catholic heritage, which prohibits the eating of meat on Fridays and during Lent, is the proliferation of salt cod dishes, such as this delightful “fasting” rice. 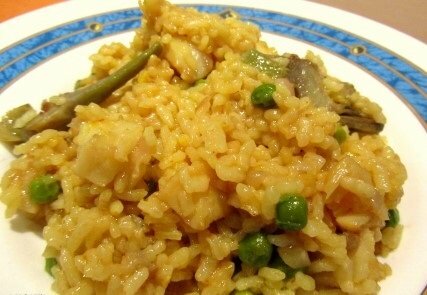 In this recipe, the cod is cooked with the rice mixture without desalting first. Squeeze the juice from the lemon half into a large bowl filled with water and set aside. Working with 1 artichoke at a time, peel off the tough, dark outer leaves. Cut off the stem flush with the bottom, cut off the top two-thirds of the leaves, and quarter the artichoke lengthwise. Using a small, sharp knife or a spoon, remove and discard the fuzzy choke. Slip the quarters into the lemon water. When all the artichokes have been trimmed, drain and pat dry. Rinse the shredded salt cod and pat dry. 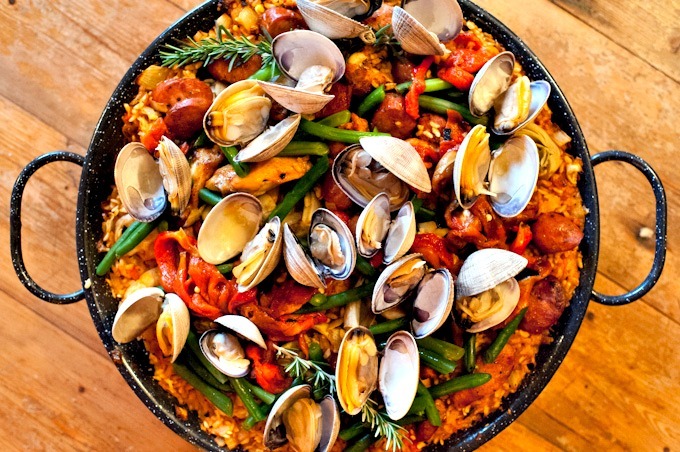 In a large (about 15-inch) paella pan, heat the olive oil over high heat. Add the tomatoes and garlic and sauté for 1 minute. Decrease the heat to medium, add the artichokes, bell pepper, and salt cod, and cook, stirring constantly, for about 10 minutes. Meanwhile, in a saucepan, bring the water to a boil. Add the rice to the paella pan and stir to mix well. Pour in the boiling water, decrease the heat to medium-low, scatter the peas over the top, and cook for 15 minutes longer. The rice will be tender at this point. 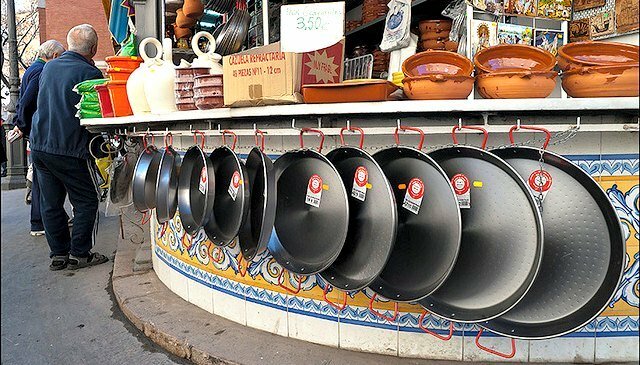 Remove the pan from the heat, cover, and let rest for 5 minutes. Taste and adjust the seasoning with salt and serve.